Hi all. 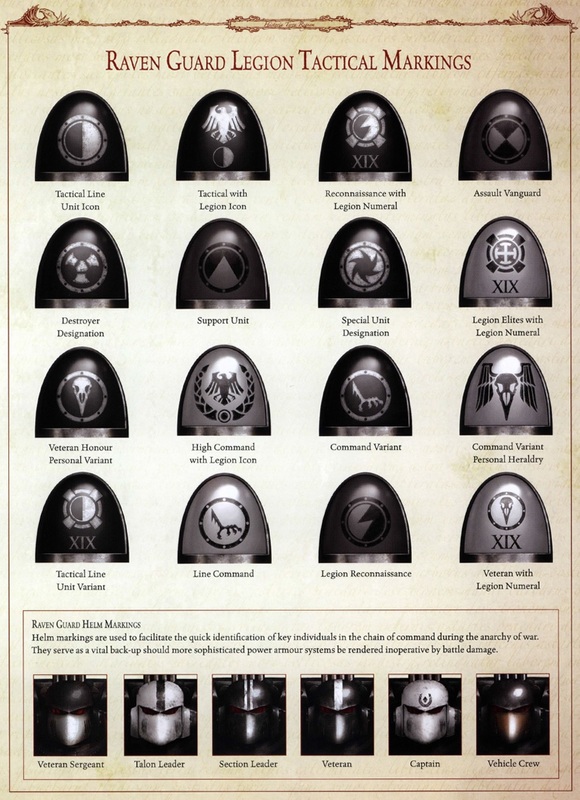 I have a few questions regarding current Raven Guard heraldry questions. 1. Veterans have white arms, shoulders, and gauntlets right? 2. Veteran Sergeants have all of the above plus a white helm right? 3. Officers such as Captains and Lieutenants always have white helms? They may also have the same arm, shoulder, and gauntlet color as a veteran too right? 4. What color is the helm of a regular non-veteran Sergeant? In response to questions 4 and 5. All sergeants are veterans now. A primaris would be painted the same way you would paint a normal ravenguard guy. As they have no vetrans besides lieutenants and captains who would have white sleeves they would basically be some form of black with one shoulder pad a different color. Note although they are not placed in that role in the codex aggressors are heavy support, and revers are assault troops. And it answers my questions. I think with Lieutenants I made put a red stripe down the top of their helmet or something appropriate like that? Any feedback or ideas are welcomed. The only issue with the above pcture using the B+C painter is that the color trim on the right shoulder is following an idea presented back in the 3rd edition RG article where the squad type was noted by color. The current and previous 2-3 editions of the Codex openly declare they use Codex-adherent color trim to match the Company number (red = 3rd Company, black = 5th Company, etc.). Otherwise it is relatively accurate as it was made before the re-introduction of the Lieutenant rank. In this regard, the Dark Imperium booklet shows a Primaris Lieutenant with white arms/shoulders and a black helmet; no other symbol of rank or company. For my part, I ascribe to the guiding principle that each Company has relative autonomy in field operations. This leads to the Company Captain being able to use different identifiers as a way to confuse the more astute observer. Alternatively, because the Chapter is Codex-compliant, they would use it's methods across the whole Chapter. The advice I would give is pick a scheme you like and are able to paint, codex be damned. I paint Fifth Company with all black shoulder pads. My sergeants get a red squad icon to denote their status, while line Marines get white. Silver for everyone's decorative elements like chest aquilae, skulls, etc. My vets all get white helms and pad trim with white on their decorative elements. Sergeants are distinguished by wargear and pose. My Captain looks a lot like a veteran, but is helmetless. Thanks Race. I'm aware of that change and will be running right shoulder trim as indicating company. Probably doing 3rd company (red). Probably a white helm with red stripe for a Lieutenant? Shadow Captains are so unique and identifiable by those they lead, that a white helmet is fine for them. Faction: Dusk Crows, RG Successor. The 7th edition codex (with the formations) has the best section on heraldry and paint schemes that I've seen. It has a lot of ideas for how to deal with oddities like having a studded shoulder pad, as well as stuff like centurions and vehicles.